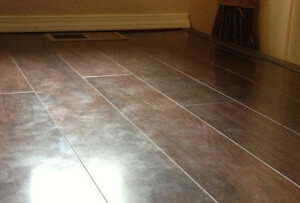 Sixteen months ago we had Shaw Brazilian Vue laminate flooring professionally installed in our home. It replaced a messy patchwork of old vinyl and hardwood floors in our downstairs. Our installation area included our kitchen, dining room, front entrance, front hallway, and downstairs half bath. All told, we covered about 478 square feet with Brazilian Vue at a cost of $4,124 for materials and installation (before tax – the final price was $4,515). I’m not thrilled with the floor and I would not buy Shaw’s Brazilian Vue again. Shaw’s Brazilian Vue attracted us with its low price and now we’re paying for it in other ways. Every footprint shows. EVERY FOOTPRINT. EVER. After a month of show-room stalking, taking home samples, reading online reviews, looking at them at different times of day, photographing samples and asking our parents for their opinion, we settled on Shaw Brazilian Vue in Rain Forest. What I actually have is a dust-covered footprint mosaic that stays that way despite weekly cleaning, a shifting board with a large crumb-filled seam, and a few scratches despite light usage. So let’s talk about Shaw Brazilian Vue itself. I’m disappointed by Brazilian Vue’s durability. After sixteen months there are two noticeable scratches (that I’m aware of) and some more subtle wear throughout. Two scratches may not seem like a big deal but let me tell you how little we have used this floor. We have no pets or children. We both work full time, and when we are home, we’re typically upstairs at our computers. We take our shoes off as soon as we come inside. Our shoes are soft-soled sneakers, and I put on high heels maybe once a year and I don’t walk around the house in them. 95% of the traffic on this floor is either barefoot or in socks. We installed the floor after finishing the rest of our downstairs projects, specifically to limit how much activity the floors would be exposed to. I padded the feet of our dining table and chairs as soon as the floor was installed. I cannot imagine what a wreck the floor would be if we actually, you know, used it the way a lot of people use their floors. We were super careful, so I’m sad that we managed to scratch it in the first year of its life. 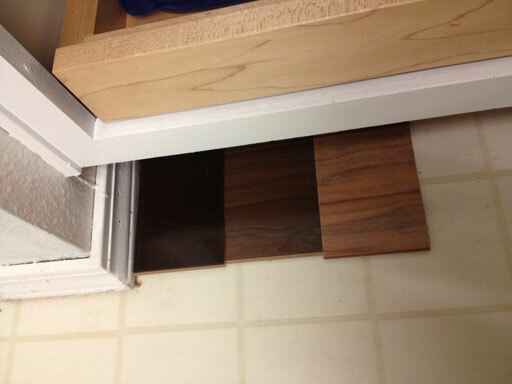 I would not recommend installing this floor to a home with children, clawed pets, or anyone using feet or wheels to get around. I don’t know if this is because it’s a dark floor, or because it’s a laminate, or if it’s because of something Shaw coats its floors with, but it’s ugly and I’ve never had this problem with the half-dozen other laminate floors I’ve lived over so I’m blaming it on the Brazilian Vue itself. 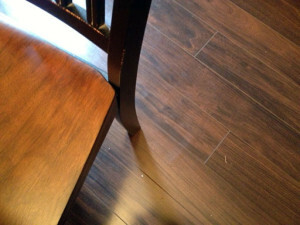 Brazilian Vue’s dark color and smooth texture looked nice in the showroom and as a sample in the corner of our kitchen, but it does not look nice in our dining room covered with crumbs and footprints. We sweep a couple times a week but it’s not enough to keep the floors looking nice because the real villains here are the footprints. Every barefoot step leaves smudges on the floor, and these accumulate until the floor is basically a dappled mosaic of footprints. The footprints don’t wipe off with a quick swiff of the Swiffer, either. I have to gently scrub the floor with a wet rag (and then they come right back). As I’ve said above, Brazilian Vue is sleek and smooth. 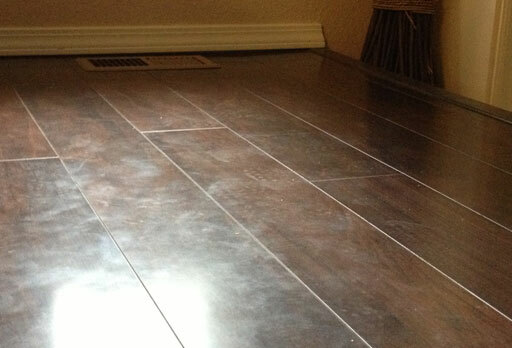 Brazilian Vue was one of the only laminate floors we found that didn’t have a crazy fake-looking texture. Most competitors had a noisy, jagged-line surface texture that looked fake and often went against the grain of the wood image printed onto the laminate. The lack of this textural “fake grain” was our main reason for choosing Brazilian Vue, but the lack of any grain at all creates a fake look of its own. (We chose the lesser of two evils.) The subtleties of real wood are nonexistent, and sometimes I think this floor looks just a bit too “perfect”, a little too machine-made. 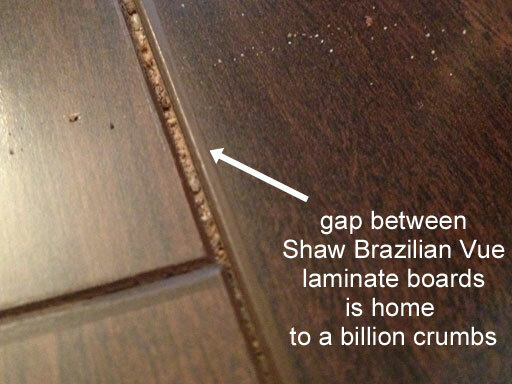 This ugly gap is another complaint I have about my Shaw floors. 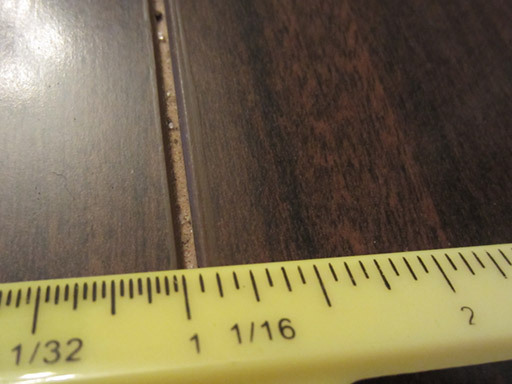 I think the pale brown is the “tongue” that normally connects the boards (rather than the underlayment, which is a white padding material). This is probably a defect of the installation that could have happened with any brand of laminate, but it’s eye-catchingly ugly, it’s located in the center of a high traffic doorway (kitchen to dining room), and it’s hard not to feel disappointed about my choice of product every time I extract another meal’s worth of crumbs from this crack. It also shifts noticeably when stepped on. Hooray. The rest of the seams are tighter and don’t attract so much dirt, but they all have this weird fake looking edge (you can see it in the above photo). The “feel” of the floor is somewhat difficult to describe, but the Brazilian Vue does feel nice to walk on. It’s got enough cushioning – not as much as our apartment or previous home’s laminate had, but enough. Aside from our noticeably shifting board in the kitchen/dining room doorway, the floor’s pops and shifts are within what I would consider the normal range. 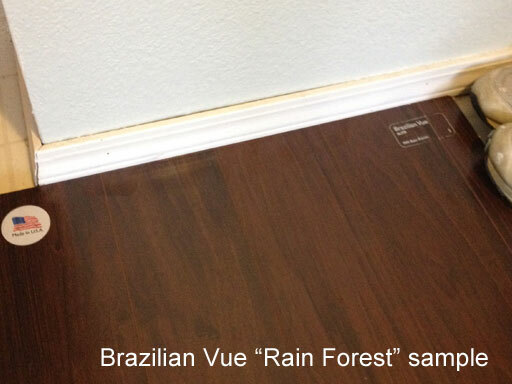 Brazilian Vue was the thickest laminate floor we considered. Here’s a photo I took in a floor vent to show you just how thick this floor is. The thin white layer under the Brazilian Vue itself is the underlayment. The Brazilian Vue probably doesn’t feel as padded to us since it’s so thick and far away from its underlayment (our first home’s laminate felt very padded, and that floor was much thinner). Be careful about selecting a floor color. We thought we were careful: we obsessed for a month over samples and looked at them constantly, and we still managed to screw it up. Brazilian Vue “Rain Forest” is way redder than we expected, even though we took home a fairly large sample (one of those jumbo ones, it was probably 16” square) and looked at it for days before making a purchase. The red clashes with our dining table, which now looks orange next to the red floor. It never looked orange to us until this floor was under it, and we didn’t spot this in our sample comparisons. There’s no room in our budget for replacing our dining table just because it clashes with the floor, so we will just deal with it. Brazilian Vue also has a certain “flatness” to its color that’s hard to describe. While it’s definitely dark and red-tinted, it still has a hard-to-describe quality that makes it appear shallow and more fake-looking than I expected it to. Don’t get dark floors. You’ll never achieve that beautiful dark floor / bright walls look. It’s hopeless. Dark floors are all footprints and dust. Cry it all out, it’s okay…then go buy something mid-toned. Do the demolition yourself and you can cut your install cost by half. Just keep in mind that it is hard, time-consuming work. Doing the demolition of the existing floors (the kitchen had five layers of vinyl and plywood) saved us almost $1000, but it was brutal labor. The old floor tear-out consumed four weeks of our free time, wrecked us physically, made the kitchen impossible to walk through, and turned our home into a construction zone for almost two months. 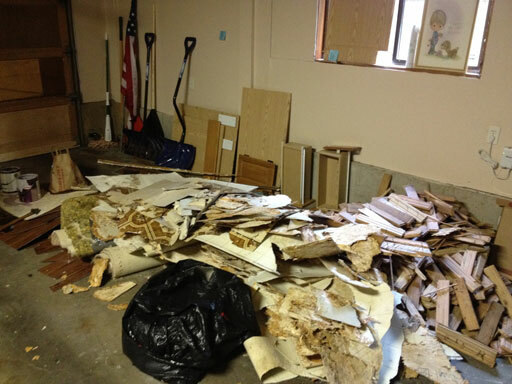 Oh, and the debris pile we generated was massive (the installers handled the removal). Still, tearing up your own floor will cut your new floor costs nearly in half so it’s hard to argue with the savings. Save up for hardwood, if you can stomach it. I’m too cheap to spend that kind of money on a floor, which is why I bought a laminate floor. 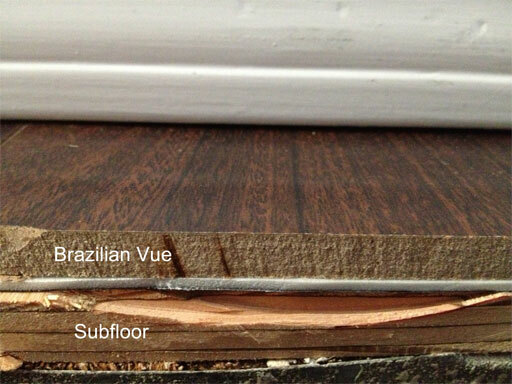 For comparison, my Brazilian Vue was about half the cost of the cheapest hardwoods that we priced out. If I had to do it over, I’d choose laminate again but I would select a lighter-colored design with a bit more texture to it.